The United States was a hard drinking country. In the mill towns, there were bars and saloons on every corner. Earlier many farmers had made their fortunes distilling their grain into liquor and shipping to Pittsburgh and Cleveland. The leaders of the Prohibition movement were alarmed at the drinking behavior of American and they were concerned that the culture of drink among some sectors was spreading. Prohibition in the United States was a measure to reduce drinking by eliminating the businesses that manufactured, distributed and sold alcohol beverages. The 18th Amendment to the Constitution took away the license to do business from these operations. New Castle PA shortly before the enactment of 18th Amendment. The “Prohibition Amendment Headquarters” is on the right. 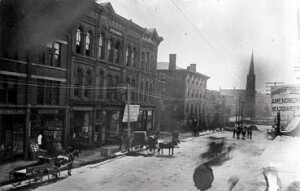 Pictured above is downtown New Castle shortly before the enactment of 18th Amendment. Note the “Prohibition Amendment Headquarters” at the right of the photo.